The Academy of Ideas and our partners, the Anglo-Israel Association, offer Jewish, Arab and International schools in Israel the opportunity to participate in Debating Matters, a unique approach to competitive schools debating in English. 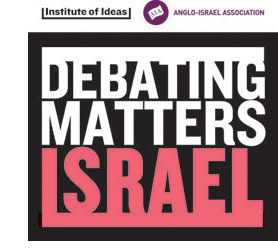 On 13th April, Debating Matters Israel returned in partnership with the Anglo-Israel Association to expand our work involving 12 schools. Hosted at the National Library of Israel, Jerusalem, many more schools, judges and guests joined the competition in our audience. Our full programme for the event can be found here. Judged by professionals from a wide range of backgrounds and areas of expertise, students had the opportunity to demonstrate their understanding of some of the big questions facing society and to debate them openly. With a strong culture of informal debate, and tradition of lively public discussion, Israel offers a great foundation for Debating Matters’ engaging, conversational format. Invited by the UK’s Ambassador, Debating Matters developed Israel’s first free to enter, English speaking debating tournament for 16-18 year olds working with a range of partners including the Israeli Ministry of Education’s English Inspectorate, Kadima Mada, The Abraham Foundation, TeachFirst Israel, Tel Aviv University and media partners like Ha’aretz, The Jerusalem Post and TV channel, 5 sport. Following a reception at the UK Ambassador’s Residence in Ramat Gan, Tel Aviv in May 2016, 6 Israeli Schools and many more guests came together at Tel Aviv University’s Porter School of Environmental Studies Capsule Building for an in-depth day of debate. As well as providing Israel’s first opportunity to use Debating Matters’ unique format, we also produced several Israel-specific debate Topic Guide resources in English for foreign language students to use for research covering: whether Animal Experimentation can ever be justified, if Megacities are bad for the Developing World, if Social Media is rejuvenating political protest and if Space Exploration is a waste of time and money.